Using mass spectrometry, researchers have for the first time read several bytes of data recorded on a molecular scale using synthetic polymers. Their work sets a new benchmark for the amount of data stored as a sequence of molecular units (monomers) that may be read using this routine method. It also sets the stage for data storage on a scale 100 times smaller than that of current hard drives. The scientists' findings are published in Nature Communications. Will hard drives one day use polymers for data storage? For several years now, researchers have faced the challenge of trying to record information with these long molecules. Polymers have great potential since the component monomers comprising one bit occupy 100 times less space than current hard drives. Their use could therefore dramatically reduce the size of computer storage media. Yet researchers have been thwarted in their efforts to effectively read polymer data. 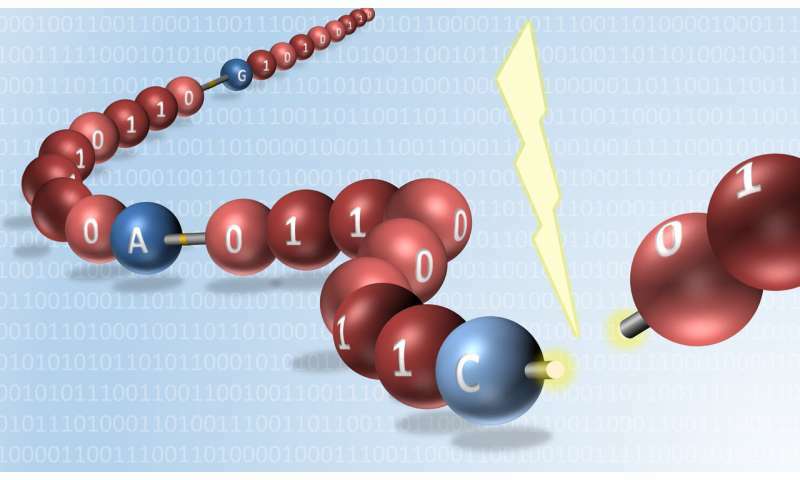 Now, a team of CNRS and Aix-Marseille University scientists has demonstrated that a mass spectrometer may be used to read long sequences of data recorded on a molecular scale. Mass spectrometers, popular among chemists, are fast and easy to use. To pull it off, the team used synthetic molecules, simpler to work with than natural molecules like DNA. Their structure was optimized for sequencing by mass spectrometry. The polymers are made up of two kinds of monomers (with phosphate groups)—corresponding to 0 and 1 respectively. After every eight of these monomer "bits," a molecular separator was added. The number of bytes represented by the complete polymer equals the number of eight-bit groups. The first step in reading the encoded information is to divide the polymer into molecular bytes by snapping it apart at the separator sites; the next is to break the phosphate bonds for sequencing of each byte. The team of chemists managed to synthesize polymers that can store up to eight bytes. Thus, they were able to record the word "Sequence" in ASCII code, which assigns a unique byte to each letter and punctuation mark. By successfully decoding this word using mass spectrometry, they set a new record for the length of a molecule that may be read using this technique. Although manual analysis of the digital data takes a few hours, it should be possible to reduce the time needed to a few milliseconds by developing software to perform this task. By associating short read times with current automated methods for writing data, this work paves the way for synthetic polymer storage of several kilobytes of data, roughly equivalent to a page of text—just like the very first floppy disks.